The day has arrived, welcome to our biggest patch to date! Of course it is practically unavoidable that changes of this magnitude will bring some new bugs, so we will closely watch your reports on the forums in the coming days and put out small fixes if necessary. Added three outposts to every island. These are basically smaller terminals, they work the same way as their bigger counterparts, have base facilities, you can rent corporate storages and perform market trading. However there are no NPC vendors on them, so you can make big money for example by supplying all the mission running agents with ammunition. NPC corporations now offer altogether 465 assignments distributed among all terminals and outposts, on inner and outer zones as well. Assignments currently have 6 so-called confidentiality levels, with increasing difficulty. The higher levels become available by improving your relation with the contractor corporations by successfully completing assignments for them. The majority of assignments now also offer special ammunition types as a reward. These are not manufacturable and cannot be reverse engineered, they are only available here. The robot equipment window got a new layout: you can now easily see slot types and sizes even if there is a module installed, and it even shows where the selected module is on your robot. A repair button is now also available here when your robot is damaged. This long-awaited feature is finally implemented, you can now trade items directly with fellow agents at the same terminal as you are. Simply right click on an agent and select "Trade". A new option related to this has also been added to your agent profile, where you can disable accepting trade offers. You can also see this setting on other Agent's profiles if they don't want to be disturbed by your petty offers. Completely renewed the terrain textures, improved the day-night cycle, weather and overall lighting. All islands also received further terraforming improvements and a few in-zone teleports. Electronic warfare mechs and industrial NPCs have appeared throughout all islands. These new industrial robots also drop new types of kernels: all industry-related technology can be researched using these from now on. The first part of the tutorial is now complete and will automatically start for new players when they first arrive on Nia. It features quick guides for basic movement, combat, scanning and mining. If you had to break off the tutorial for some reason, you can restart it by right-clicking on the deploy button when you are inside a terminal. 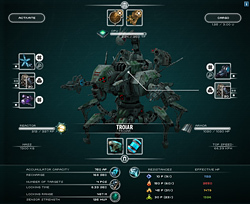 New: Improvements in robot position and line of sight calculations. New: Option to disable doupletap autorun. New: Assignable hotkey for toggle-type autorun. Fix: Alpha strike didn't work while another lock was in progress and selected. Fix: Proper error message when trying to enter a terminal with a PvP-flag. Fix: Clicking an opened terrain context menu after docking or when the parent window wasn't present anymore resulted in a client crash. Fix: Modules won't use a cycle of energy anymore when the target is out of range. Fix: Modules will now properly deactivate when using them on an invalid target. Fix: Field containers lost their security codes when the owner entered a terminal or logged out. Change: Loot containers now have a security code tied to its owner for 5 minutes. After 5 minutes they are free for all to take, up until their 10 minute lifetime. Fix: Ammo duplicating was possible when the robot was in a container. Fix: When taking everything from a loot container, sometimes a new one spawned in its place. Fix: Unstacking didn't work when the remaining stack contained 0 items. Change: Remote repairing NPCs is not allowed anymore. New: The radar will now display tooltips for everything if you hover over them with the cursor. Fix: The sudden health drop of robots after certain equip actions (mass reductor, armor plate) has been fixed. HP percentage will now remain constant during these actions. New: Leaving the input box empty when renaming a robot now reverts to the robot's default name. Fix: Robot information windows now show unmodified bonuses when viewed from the market. Change: Changed the way how the mass of robots is calculated and also increased the mass of all modules, so equipped modules now affect your robot's mass and thus its speed even more. Change: Armor repairer tunings now also decrease the accumulator usage of armor repairers. Change: All mass reductors have been boosted and renamed to lightweight frames. They also have become unique modules, which means you can only equip one per robot. Currently equipped lightweight frames have been unequipped to prevent invalid fittings. New: New login and character creation backgrounds. New: Proper icon for the Prototype facility. New: Added icons for robot shards. Fix: The Vollert medium missile launcher had a light launcher model. Fix: Some cache and memory optimizations. Fix: No more black/blank avatars after alt+tab window switching. Fix: Fixed black borders on the sides when using a wider screen ratio than 16:9. Fix: The extensions window will now refresh itself more often when kept open to show new options as more EP becomes available. Change: The former extension 'Shield technology' is now called 'Improved shield technology'. Change: Increased the bonuses of the buy and sell order extensions from 3 to 5 at advanced, and from 5 to 10 at expert levels. Also increased the rank of expert extensions from 4 to 5. New: Improved the layout of the Reverse engineering window. It now shows the attributes of the resulting calibration template and also indicates when it needs a manufacturing unit of items instead of just one piece. New: Confirmation window when researching kernels. New: Kernel research will now check beforehand whether you have all the information already from the selected kernels and will tell you so. Kernels will not be consumed in that case. New: Expected material requirements are now shown when adding a CT into the factory. Fix: Efficiency info on a freshly created CT was only visible after refreshing the storage window. Fix: Refinery input will now again default to the maximum amount possible. Fix: Reverse engineering ammos consumed only one piece instead of one manufacturing unit. Fix: Removed the sell option from CTs. Fix: Industrial tunings' research data was missing from kernels. Change: Reverse engineering requires items to be packed from now on. Change: Disabled kernel research from corporation storages. New: Facilities will now find the required resources and materials in all subcontainers and robot cargos. Change: Mech and heavy mech class robots and also named items require now more epriton to manufacture. Change: Removed epriton fields from inner zones. New: There is now an option to extract CTs from calibrated production lines, with a material/time ratio penalty for the extracted CT. A new extension which reduces this penalty with every level called "Calibration template extraction efficiency" has also been added. New: Confirmation window when clearing corporation storage logs. Fix: Logging didn't work when a folder was created after logging was turned on. Fix: Removed unsuitable contextmenu options from corporate storages and folders. New: Removed police towers from inner zones as they have become obsolete and added more to outer zones to properly cover terminals. Fix: A rank 1 Tyrannos NPC was accidentally dropping nuimqol shards. Fix: The world map will now display assignment points. New: Mission items can be delivered now also when they remain in your robot's cargo. New: Introduced decimal points for NIC amounts. Change: The default value when buying items is now 1. Fix: Selling items from robot cargos or containers works again. Change: Area scan percentage numbers on the map have been moved to the top left corner of the scanned area so that they don't get overlapped by the "yourself" icon right after making the scan. Fix: When a main menu window is in a minimized state, clicking the main menu button for it will bring it up instead of closing it. New: Added even more types of ambience. New: Improved many sound effects, including some robots, missiles, explosions, hit effects and locking sounds. New: Added sound for reloading. New: Added sound for new private chat messages. Change: Added a less annoying effect for the default chime (like when buying something). Fix: The age-old sound effect-switching bug (most notably when explosions had a tree-cracking sound) has been fixed. Change: Options: the special effects checkbox has been changed to a slider. The rightmost setting enables both bloom and sharpen effects, the middle setting has only bloom, and sliding it all to the left turns off both. Change: Chat input is now single-line and scrolls as you type. Fix: The "Suppress police warnings" option will now also disable the warnings received when you leave a police protected area. Fix: Changing the sorting in the chatlist window caused the wrong channels to open when double-clicking them. Fix: Faulty server response when uploading a crash dump. Fix: Mail outbox: clicking "Open profile" on an outgoing mail will now open the recipient's profile instead of your own. Fix: Capturing screenshots in fullscreen mode didn't work under Windows 7. Fix: Search will now tell you if there were no results and will properly update window contents when switching tabs. New: Containers and folders are now sorted first in storages. New: "Stack all" renamed to "Storage stack". New: Added a "Gather" option for non-packageable items like ammos, materials or kernels. This will collect all items of the selected type from all subfolders, containers, and optionally also from robot cargos in the current storage. New: Added "Top agents" tab to the News window, which shows the list of agents with the most PvP kills for the last 30 days.